The national costume can tell us about age-long traditions, customs and aesthetic priorities typical of each regional culture. 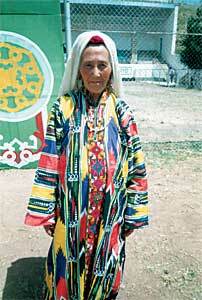 Uzbekistan clothing is special but of different regions of Uzbekistan it differed. Clothing of Surkhandarya people, and first of all of the Kungrats, is especially interesting. Women clothing is very complex and had been forming for centuries under the influence of local conditions, climate and occupations. It includes under-dress and dress, pants (lozim), overclothes, headwear and footwear. But everything depends on the age of the women, that’s why the standard costume can be changed and decorated more freely and interesting. At the second half of the XIX c. married women wore the straight wide dress with long sleeves. Under the influence of the Russian fashion the dresses with upstanding collar became popular. With the passage of time pleated frills decorated its upper part. 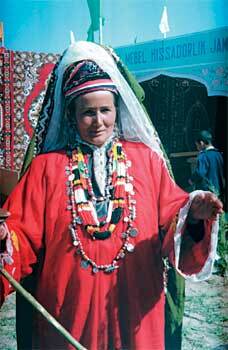 Now such clothing is used on holidays and for ritual ceremonies. Among pieces of overclothes there is a robe tossed on the head – capote-kurta (zhelak). Kurta reminds chapan, but its false long sleeves are turned back, fastened to each other. The most interesting part of national clothing is the headwear of Kungrat women. It consists of tyubeteika, shawl, kyigich (kulta), “bosh” (ad verbum – a head). The headwear “bosh” is very unusual and is twisted round like turban and presents a complicated structure consisted of several elements. First, a small cap kyigich (kulta) with over-plait fixture is being put on, and then it is being muffled with 3-5 meters of red or vinous fabric. In our days “bosh” is mainly the headwear of old women. What can we learn from local people?